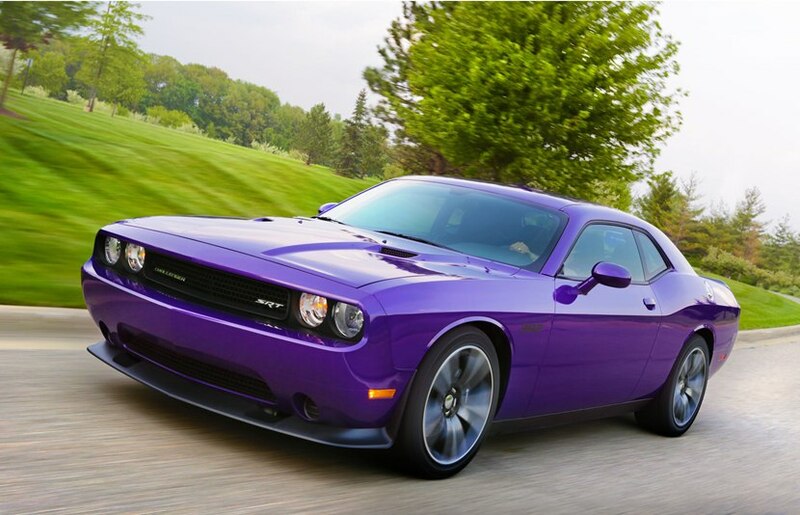 Continuing on the muscle car era, the 2016 Dodge Challenger still rules the road. All of the style and history of the original 1970’s Challenger is available in the tamed down SXT trim. Unlike the somewhat limited options of the past, today’s buyers have more options to customize the engine, interior features and exterior colors. The engine in the SXT is fierce and it gets better gas mileage than its sibling engine, the SRT Hellcat. The SXT is equipped with a Pentastar 3.6-liter V6 engine that produces 305-horsepower and turns out 268 ft.-pd. of torque. The car’s power is routed to the rear wheels through the Torqueflite 8-speed, shiftable, automatic transmission giving the SXT estimated mileage of 19 MPG in the city and 28 MPG on the highway. The body of the Challenger SXT sports dual exhausts and a shaker hood. The SXT rides on 18-inch satin carbon aluminum wheels and Michelin tires. In case of a flat tire, a compact spare tire can be found in the trunk.The circular LED running headlights are planted in the front grille which strongly resembles the classic front grille of the original Challenger. For convenience, the exterior side mirrors are powered and heated. Buyers have the option of seven exterior colors and in March, Dodge added the bright orange hue called, ‘Go Mango,’ as a special-edition color for 2016 Challenger and Charger models. wheel that has a tilt and telescoping to get it in the exact position when driving. The nicely appointed cabin of the coupe seats five and Dodge’s Uconnect system with voice command makes controlling the electronics easier than ever. 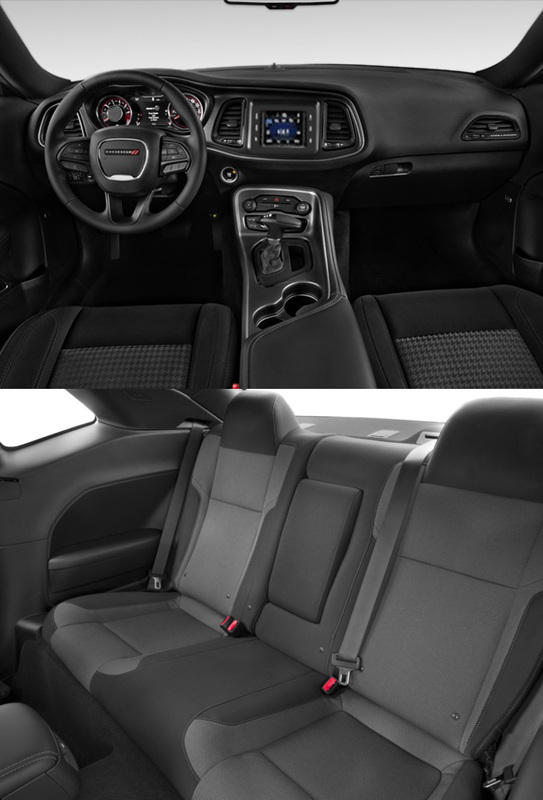 The cloth upholstery wraps the front bucket seats, and leather interior is available in upper trim levels. The driver’s seat features a six-way power with power lumbar support and height adjustment to ensure they can find the right position during long trips.The dual-zone climate control and rear ventilation gives drivers and passengers the freedom to set their zone’s temperature. The 5-inch touchscreen of the UConnect infotainment system allows the driver easy access to control the 6-speaker audio system. The SXT is equipped with an auxiliary audio input, a USB external media port, and Bluetooth wireless connectivity. The safety features of the Challenger SXT are as strong as the vehicle looks. Head air bags front, rear, and dual-side airbags keep the driver and passengers safe in the event of a mishap. Since stopping is as important as quick, off-the line starts, the Dodge Challenger is equipped with slotted front disk and solid rear disk brakes with four wheel anti-lock brakes and electronic brake assist. The 2016 Dodge Challenger SXT has a starting MSRP of $26,995. Those interested in the most decked out Challenger, the Challenger SRT Hellcat, which is equipped with the 707-horsepower Supercharged Hemi engine, are looking at a starting price of $64,195. All Dodge’s are backed by a 3-year or 36,000-mile limited warranty, 5-year or 100,000-mile powertrain warranty and 5 years or 100,000 miles of roadside assistance. One of the few full-sized coupes with true five-passenger room, the Dodge Challenger SXT is the perfect car for those who want the comfort and space of a larger car that still has a sporty persona.